Universe details: In the isolated city of Crescent where these characters live, superpowers spring from close encounters with death. Only people born in the city can gain these powers, and since this is a relatively new settlement, the first generation of people born there are just starting to show signs of super-fication. This means mostly kids and teens. Of the teens, Camille, Max, Amelia, Walter, and Rin decide to team up and form a band. They take it upon themselves to help other kids who are just getting powers/dealing with death. Eventually, when The Band realizes that everyone deserves to be informed about the city’s unique predicament, they try to reach every kid in the city at once by putting on a live concert. Body type: Advanced toddler. Moderately chubby. Hair: An untamed mess of dark brown squiggles. Eyes: Reddish brown. They have an indescribable fire in them. Attire: Eric never takes off his dragon costume. It’s unclear how long he’s been wearing the thing, or how he bathes. To him the costume is a second skin, and removing it would be like being skinned alive. Superpowers: Eric’s powers make him what he always thought he was: a dragon. Most of the time he remains in his human form, in costume, but if prompted by danger or desperation (or the need to bathe) he changes into his dragon form, which basically involves his body merging with the costume until the costume comes alive. He does not grow huge, or have wings to fly, but he can breathe fire (in both human and dragon form) and while in dragon form his armored skin is virtually impenetrable. 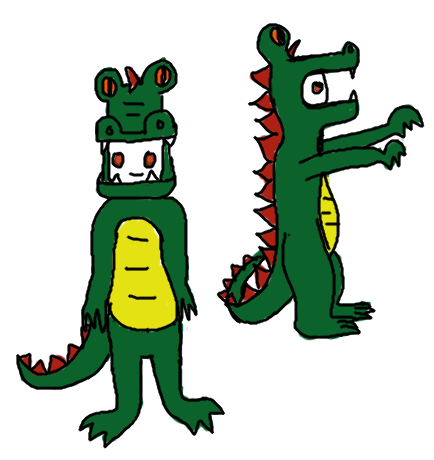 As a dragon he moves very quickly and has dangerously sharp claws and teeth. Personality: Eric is very smart for his age, but overly imaginative. His favorite book is Grendel by John Gardner (he likes the dragon in it). His favorite day is Halloween (his costume is always the same). He doesn’t have many friends on account of his odd behavior, so he goes to The Band when he wants to socialize with someone who understands him. He doesn’t fight alongside The Band, however, unless he is compensated with treasure to add to his slowly growing hoard. a. Eric was at The Band’s first concert, where overenthusiastic heroes killed a person disguised as a usually robotic police officer.